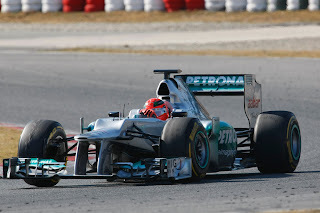 Talking about F1: The F1 blog: F1 2012 Season Preview: Mercedes - Will the Silver Arrow hit the target? F1 2012 Season Preview: Mercedes - Will the Silver Arrow hit the target? So we are about to start the latest chapter of the curious case of Mercedes GP. It is a marque with an exemplary heritage in F1, including recent success. They took over the champion constructor at the end of 2009, and the team is headed up by one of the finest brains in the sport. And yet, in the proceeding two years all they can point to is three podium finishes in total, with third place their best result. If anything, 2011 represented a step backwards, with no podium places at all. Of course, in both 2010 and 2011 there were mitigating circumstances in their relative struggles. In 2010 Mercedes team principal Ross Brawn could point to the necessary 40% cuts of the Brawn staff during the previous season, with hampered development of the 2010 machine. In 2011 the reasons were harder to put down to circumstance, as the car was fundamentally flawed. This was mainly down to a too-short wheelbase (which was in turn related to the team not foreseeing the potential of aggressive exhaust blowing of diffusers when designing the car), which resulted in too high a centre of gravity on full tanks on race day, as well as excessive rear tyre wear. This all added up to them qualifying an average of 1.6 per cent off the pole time over the 2011 season, and ending up a very distant fourth in the constructors' standings. But even with all of the excuses, the record of achievement is not what anyone at the team hoped for and, three years into the project, signs of progress must be shown this year. If not, Stuttgart HQ may have something to say. Thus the pressure is on in 2012 for the Brackley squad. And they certainly are responding to this pressure. Over the last year or so they've adopted an aggressive head hunting strategy, and can now count no fewer than five former technical directors of other F1 teams on their payroll (including Brawn himself), and they gave up the development of their 2011 car early to concentrate on 2012, just as Brawn did for the stellar 2009 campaign. And the W03 has been well-received in testing so far. Its late launch got many, including Adrian Newey, suggesting that the Mercedes would feature the sport's 'next big thing' that everyone would have to copy. While a 'silver bullet' hasn't revealed itself on the machine yet, it still has turned plenty of heads with what appears to be number of interesting details. Craig Scarborough commented that the car is 'substantially different' to what Mercedes have produced before. The sidepods are small and sculpted, but it's the front wing that's caused the biggest round of head-scratching. It's thought that the slot on the front of the nose feeds air in the direction of the front wing via the nose pillars, possibly as some kind of passive 'front wing f-duct', or perhaps to do something even more novel than that. The W03's diffuser and exhaust solution also looks particularly innovative. More importantly, the W03 looks stable out of track with a lot of bite at the front end, and happily for the team it also has run reliably so far. Some are even talking about it being at least somewhere close to Red Bull and McLaren on pace and possibly ahead of the Ferrari (though the Scuderia have thus far been a moving target). There is at least one false note struck though, there has been the odd suggestion that the W03, like the W02, is not the kindest on its tyres. Other, more broad, possible false notes are whether their abundance of talent will result in 'too many cooks' rather than a dream team. One could argue that such a collective lacks the clear vision and direction that the totemic Newey provides for Red Bull, and at the very least managing the various ideas and personalities will be a challenge. And even more broadly than that, the Brackley unit under its various guises over the years (since Tyrrell was bought out in 1998) has, aside from 2009 and to a lesser extent in 2004, persistently failed to deliver on its potential. It raises the possibility that there is something fundamentally amiss there. Ross Brawn said at the time of the launch that 'better than fourth' in the constructors' table is an objective. Bearing in mind Mercedes go into the year as a team who did not even get a podium finish in 2011, that's probably asking an awful lot, and also would be somewhat reliant on one of the 'big three' seriously getting it wrong this year. Since, Brawn appears to have managed expectations downwards a bit, talking instead that a win this year would be 'icing on the cake' and that podiums are the 'certainty of what the ambitions are'. On the evidence so far, Mercedes have given themselves the best chance of stepping the right direction in 2012. It can't be denied that, in terms of success, Michael Schumacher's return to the sport has been far short of expectations. After two years back the seven-times champion has yet to achieve a podium finish. Worse, he's generally been shown the way by his team mate, and often shown a clumsiness and, sometimes, an egregiousness when racing wheel-to-wheel. Still, it also can't be denied that the Michael Schumacher on show in 2011 was a marked improvement on that in 2010. 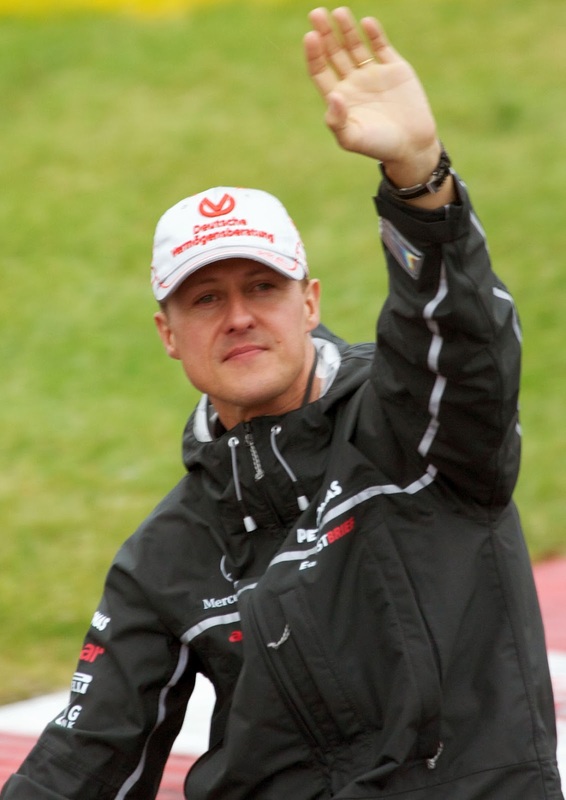 Many observers reckoned that Schumi's retention at Mercedes in 2010 in the face of poor on-track performances owed mostly to his PR benefits, as well as to the potential embarrassment of a German company being seen to give such a German icon his jotters. But such talk subsided last year, at the least Schumi showed he was worthy of a place in the team. It seems that Schumi hasn't quite got the raw speed that he did in his first career, not for a qualifying lap anyway. But in 2011 he was smart enough to put the other skills that were as sharp as ever to good use. On race day few were as strong as he in planning the duration, looking after the tyres and ghosting up the order. 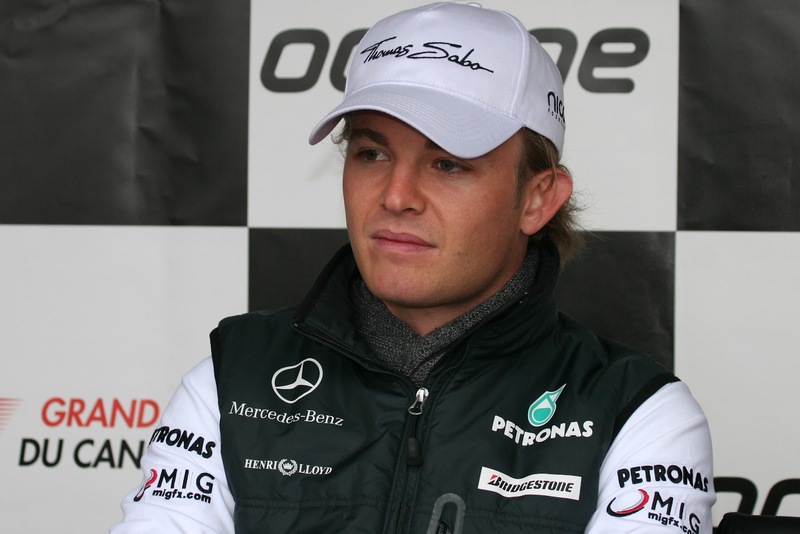 This state of affairs is underlined by that, while he was outqualified by stable mate Rosberg 16 times to three in 2011, he was much closer on race day, Rosberg outscoring Schumi only by 89 to 76. Such guile was most clearly seen from Schumi in Canada, when on a variably wet day he made several overtakes to place second late on, only for the double-DRS zone to deprive him of a podium finish. As Ross Brawn recently commented on his pilot: 'he's still got it, but in a different way'. So, Schumi starts out for 2012 (at the tender age of 43 - his enthusiasm to continue certainly cannot be called into question). Mercedes may make a step forward this year, so it'll be interesting to see whether, with a better car and new Pirelli tyres, Schumi can make a step in turn. But there are also traps if this happens: some of the deficiencies on display this year, such as the poor qualifying and a few too many errors, if repeated may be exposed and punished more ruthlessly in such circumstances. It's one of contemporary F1's great unanswered questions: just how good is Nico Rosberg? Unfortunately last year didn't provide many more clues. It was more of the same for Nico, and if anything the Mercedes was even more adrift of the 'big three' teams on pace in 2011 than 2010, but at the same time usually clear of the midfield, meaning he had almost no opportunity to 'mix it'. And his team mate, while improved, wasn't much more of a reliable yardstick for him. There are those within and without F1 who rate Nico very highly, seeing him as a talent from the top order, smooth and quick, and only waiting on a set of wheels with which he can do himself justice, much as was the case for Jenson Button for years. There are others for whom the jury remains out on Nico - he's good sure, but is he that good? It's hard to fault how Rosberg drove in 2011, given everything. He did what could have been expected with the flawed car at his disposal, even though the race day handling problems tended to result in a slow slide away from the front runners. He generally was the quicker of the two Mercs, especially in qualifying, and as in 2010 he tended to avoid mistakes, stay clear of trouble and avoided conspicuous sulks or tantrums (though you could maybe argue that is a weakness as much as a virtue). And this year he's been driving well in testing, showing Vettel-esque perfect, minimal, steering inputs to optimise the Pirelli tyres. Hopefully, with a rapid W03 underneath him, in 2012 we'll finally begin to answer the enduring question of how good Nico Rosberg actually is.